How can abdominal adhesions cause intestinal obstruction? How can abdominal adhesions cause female infertility? What are the symptoms of an intestinal obstruction? How are abdominal adhesions and intestinal obstructions treated? Can abdominal adhesions be prevented? Abdominal adhesions are bands of scar tissue that form between abdominal tissues and organs, causing them to stick together. Symptoms caused by abdominal adhesions vary; however, most adhesions do not cause symptoms. Typical symptoms caused by abdominal adhesions include abdominal discomfort around the belly button that is cramp-like followed by distention of the abdomen. Symptoms may become intense with obstruction. Abdominal surgery is the most frequent cause of abdominal adhesions. Other causes of abdominal adhesions include inflammation of an organ such as cholecystitis or appendicitis, peritonitis, foreign objects left inside the abdomen at the time of surgery, bleeding into the peritoneal cavity, or inflammatory conditions such as pelvic inflammatory disease. At the sites of where abdominal adhesions occur, the intestine can twist on itself, and the twisting may obstruct the normal movement of its contents (particularly in the small intestine). Abdominal adhesions that cause a complete intestinal obstruction may be life-threatening and require immediate medical attention and often surgery. Abdominal adhesions can cause female infertility by preventing fertilized eggs from reaching the uterus, where fetal development takes place. No tests are available to diagnose adhesions, and adhesions cannot be seen through imaging techniques such as X-rays or ultrasound. An intestinal obstruction can be seen through abdominal X-rays, barium contrast studies (lower or upper GI series), and computerized tomography (CT). The treatment for abdominal adhesions is either laparoscopic surgery or open surgery whereby the adhesions are cut by scalpel or electric current. Abdominal adhesions are important because they are a common cause of abdominal symptoms, particularly abdominal pain. The term adhesions refers to the formation of scar tissue between bowel loops (small or large intestine) and the inner lining of the abdominal wall (peritoneal lining) or with other organs within the abdominal cavity (liver, gallbladder, uterus and its attached Fallopian tubes and ovaries, and urinary bladder). Adhesions can also form between loops of the small and large intestine. Abdominal adhesions are bands of tissue that form between abdominal tissues and organs. these vary from a consistency of wet tissue paper, which are of little significance, to a strong, fibrous band that can readily cause obstruction. Normally, internal tissues and organs have slippery surfaces, which allow them to shift easily as the body moves. Adhesions cause tissues and organs to stick together. 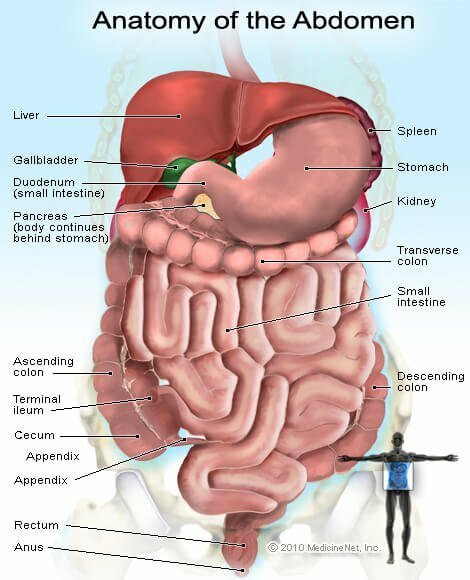 The intestines are part of the digestive system. Abdominal adhesions can cause an intestinal obstruction. Although most adhesions cause no symptoms or problems, others cause chronic abdominal or pelvic pain. Adhesions are also a major cause of intestinal obstruction and female infertility. Rarely, abdominal adhesions form without apparent cause. Abdominal adhesions can kink, twist, or pull the intestines out of place, causing an intestinal obstruction. An intestinal obstruction partially or completely restricts the movement of food or stool through the intestines. A complete intestinal obstruction is life-threatening and requires immediate medical attention and often surgery. Abdominal adhesions cause female infertility by preventing fertilized eggs from reaching the uterus, where fetal development takes place. Adhesions can kink, twist, or pull out of place the fallopian tubes, which carry eggs from the ovaries - where eggs are stored and released - to the uterus. Although most abdominal adhesions go unnoticed, the most common symptom is chronic abdominal or pelvic pain. The pain often mimics that of other conditions, including appendicitis, endometriosis, and diverticulitis. A person with these symptoms should seek medical attention immediately. No tests are available to diagnose adhesions, and adhesions cannot be seen through imaging techniques such as X-rays or ultrasound. Most adhesions are found during exploratory surgery. An intestinal obstruction, however, can be seen through abdominal X-rays, barium contrast studies - also called a lower GI series - and computerized tomography. Treatment for abdominal adhesions is usually not necessary, as most do not cause problems. Surgery is currently the only way to break adhesions that cause pain, intestinal obstruction, or fertility problems. More surgery, however, carries the risk of additional adhesions and is avoided when possible. A complete intestinal obstruction usually requires immediate surgery. A partial obstruction can sometimes be relieved with a liquid or low-residue diet. A low-residue diet is high in dairy products, low in fiber, and more easily broken down into smaller particles by the digestive system. Abdominal adhesions are difficult to prevent. However, careful, gentle, surgical techniques can minimize the formation of adhesions. Laparoscopic surgery avoids opening up the abdomen with a large incision. Instead, the abdomen is inflated with gas (carbon dioxide) while special surgical tools and a video camera are threaded through a few, small abdominal incisions. Inflating the abdomen gives the surgeon room to operate. If a large abdominal incision is required, a special filmlike material (Seprafilm) can be inserted between organs or between the organs and the abdominal incision at the end of surgery. The filmlike material, which looks similar to wax paper, is absorbed by the body in about a week and tends to minimize adhesion formation. Other steps during surgery to reduce adhesion formation include using starch- and latex-free gloves, handling tissues and organs gently, shortening surgery time, and not allowing tissues to dry out. SOURCE: National Digestive Diseases Information Clearinghouse (NDDIC). Abdominal. Last update: 4/25/2011 Adhesions. If known, what was the cause of your abdominal adhesions? Describe the symptoms associated with your abdominal adhesions. Are abdominal adhesions the cause of your infertility? Please share your experience. Discuss the events that led to a diagnosis of abdominal adhesions. How were your abdominal adhesions or intestinal obstructions treated? Did you have surgery? Ulcerative colitis surgery is performed on approximately 25% to 40% of people with the disease. There are various types of ulcerative colitis. Complications of the surgery include pouch failure, intestinal blockage from adhesions, inflammation of the pouch, and more watery and frequent bowel movements.